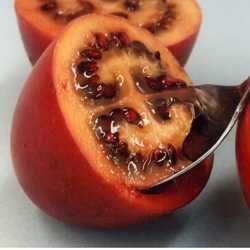 Tamarillo is a member of the Soloanaceae family, with potato, tomato, pepino and naranjilla. Once known as the 'Tree Tomato'. Native to the Andean region of Bolivia and north-west Argentina, the wild tamarillo seems to have all but disappeared from its native habitat. Tamarillos were first introduced to New Zealand in the late 1800's from Asia. However the red tamarillo was developed by an Auckland nurseryman in the 1920's. It was not until the 2nd World War that substantial quantities were produced, then an increase in production with the horticultural boom in the 1970's. Take advantage of the large sub-tropical leaf form. Good source of Vitamin A, B6, C and E. Rich in iron and potassium. Low in calories and high in dietary fibre. Cut in half and scoop out the rich juicy pulp. Or use in a fruit salad, sauces, chutneys or as a meat accompaniment. 1 plant can yield 15-20kg of fruit. 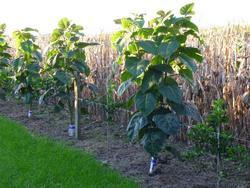 Protect from the wind as these plants are shallow rooted. Not salt tolerant. Frost tender. Light frosts will naturally prune your tree. Tamarillos need plenty of water as the huge soft leaves transpire rapidly. Any well drained site with good moisture content and high in organic matter. Choose a sheltered position with protection from strong winds and hard frosts. Incorporate blood and bone at planting. Apply three applications of low nitrogen NPK fertiliser during the growing season. One before pruning, second one month later and the third in February to help fruit development. Once your plant reaches 1 metre tall take the tip out to encourage branching and stopping the plant growing too tall so you can not reach the fruit. Frosts will naturally prune your tree. After the frost, remove old and dead wood. In areas of no frosts you will need to manually prune back growth to prevent over crowding. Always remember fruit is formed on the new spring growth, therefore a hard prune will maintain desired shape, size and maximise next seasons fruit. Tamarillos are susceptible to aphids and whitefly. Check your local garden centre for natural and chemical sprays. Fruit can sometimes have 'stone cells' around the equator of the fruit. These are hard lumps in the flesh between skin and the seeds. Sometimes they can be quite sharp. This condition can vary from tree to tree. The home gardener is advised to plant an extra tamarillo every two years if regular fruit supply is wanted. Good nutrition and watering will help to overcome this problem.